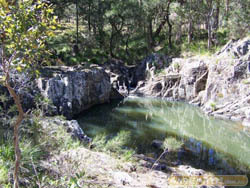 Following the Dirty Weekends in South East QLD book for the Condamine Gorge. We ran the course backwards, confused the crap out of the mrs as she was the navigator, hence the extra run into new south wales near Killarney, and the dog leg whilst on the loop inside NSW. The first pic is at the dog leg in NSW. A little water fall and billabong. Camping is allowed. Second photo is one of the 14 crossings of the Condamine river.